Comments: Broadleaf flowering tree native to North Island in New Zealand. Underside of leaves are silver green. The tree is salt hardy and grows on beaches near the sea in its native habitat, but it is not frost tolerant when young. 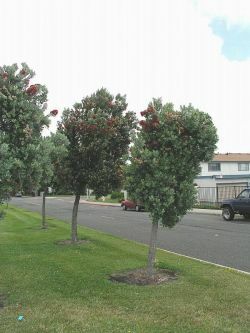 Numerous trees in Union City and Newark. 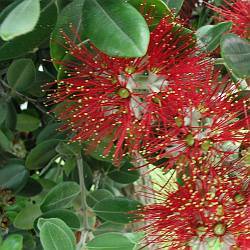 Also called a New Zealand Christmas tree because the red blooms appear during Christmas in the southern hemisphere. This tree is endangered in its native habitat.